For some events you may want to get an immediate notification. For instance via push notification on your smartphone. This article explains the configuration. In the past, event notifications were often sent by e-mail. This is still possible in the digitalSTROM system, but it is not the fastest way of transmission. Much better are push notifications, which are supported by all smartphones nowadays. Push notifications can be easily realized via the dSS app "Push Notifications". If the status is "connected to a user account", the installation has already been linked correctly. Now the receiver of the push notifications has to be set up correctly. This differs depending on whether Android or iOS is used. Android: Install the dS Dashboard or dS Home Control app. After starting the app, login must be done via mein.digitalSTROM. If the app is set up over a local connectino, the push notifications will not work. 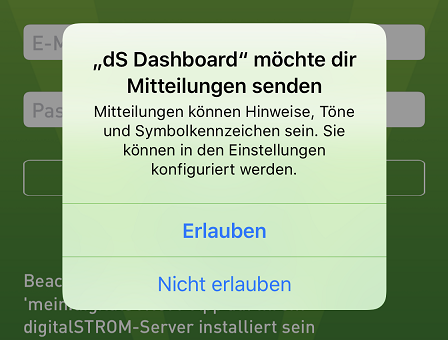 iOS: Install the app digitalSTROM Dahboard. After the first start comes a query from iOS, whether notifications are allowed or not. It is essential to type on Give permission! If Dashboard has already been set up and the notifications are not allowed, you have to proceed as follows: First you can try to allow the messages in the iOS settings under Messages / dS Dashboard. Then you need to open the Dashboard app so that it can pass the notification key from iOS to mein.digitalSTROM. If the iOS device does not appear in the device list of the dSS app push notifications later on, you have to completely uninstall the Dashboard app (keep icon pressed long, then tap "-") and then reinstall it via the App Store and perform set up as described. The settings are lost in the app. Now all precautions are taken and push notifications can be configured. To do so, please open the app "Push Notifications" on the dSS. While opening the app, the device list is read. If the app does not open completely (even after deleting the browser cache), the Android / iOS app was not set up correctly (see above). Now you can click on "new message" and define a name and a trigger. In the "message" tab, the desired push message is entered and one or more recipients are selected. If the desired device does not appear in the list, the set-up has not been completed as described above.